The Notre Dame High School soccer program is off to one of its best starts ever, thanks to a mix of talented players, from freshmen to seniors. “We have an interesting blend of young and old,” Notre Dame coach Dave Robben said. Several talented freshmen are making an impact, he said, with seniors providing leadership while sophomores and juniors are making contributions to the winning formula. “It’s just a very cohesive group right now,” Robben said. Notre Dame defeated St. Pius X 1-0 April 9 to bring the Rebels record to 6-2. The team had two overtime losses to start the season, then defeated Rosati-Kain, Lutheran St. Charles, Lutheran South, Duchesne, St. Francis Borgia and St. Pius X. Games were scheduled against St. Dominic and Westminster Christian Academy before the Parkway West Tourney from April 16-20. It’s the best start in the 15 years Robben has been coaching at Notre Dame. “The girls are just buying into all the hard work and all the effort that has to go into maintaining this level,” he said. Junior Lexi Lanzafame is a big part of the effort. She scored the lone goal against St. Pius, knocking in a rebound of a shot by sophore Amanda Aug. Lanzafame hit the crossbar twice in the first half and consistently drove to the goal. St. Pius goalie Jordyn Spreck, a junior, showed her athleticism in making a number of difficult saves. Sophomore Molly Flanagan led a strong defensive effort for St. Pius as Notre Dame kept the pressure on its opponent most of the game. Lanzafame said ball possession and communication among players was a key to the game. 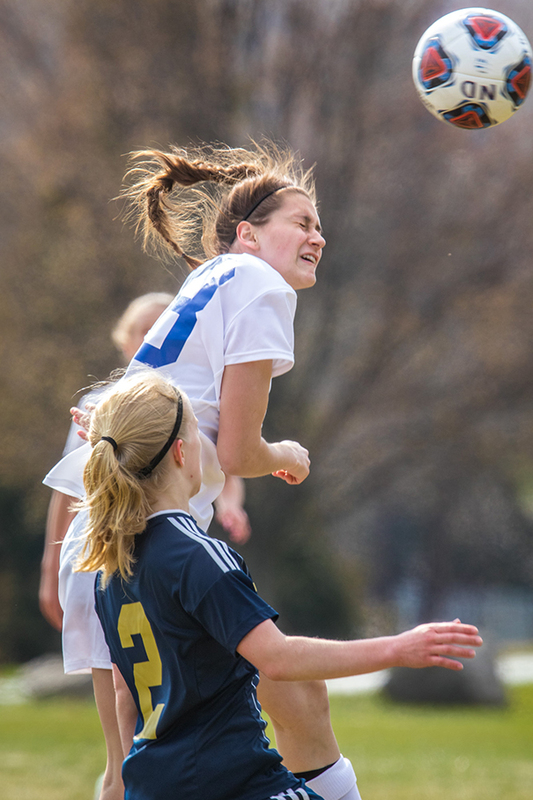 St. Pius was a worthy opponent, she said, with a talented goalie and a battler’s mentality. Notre Dame has skilled players, and “I think we’re going to have a good season. We have some new players who are really going to help us out,” she said. Freshman Grace Newsham explained that the players blend on and off the field. “As a freshman, I was nervous because I didn’t know any upperclassmen or a lot of people on the team. But they were all very welcoming and we all have one love for the team, so we utilize that out on the field,” she said. Notre Dame was in the final four of the state championship from 2007-11 and returned in 2016. The juniors and seniors on this year’s team remember that success and, recognizing the talent of this year’s team, know they can return to the finals if they work hard and stay grounded, Robben said. It’s a faith-filled team that want to have success but keep that in perspective, the coach said. “We say a prayer before the game, and I ask the girls to think about that, what it is we’re trying to do,” he said. Newsham noted that the team prayed the Our Father at halftime of the St. Pius game to get mentally prepared for the next half and for players who were physically banged up during the game.